NOTE: recently the manufacturer of this item changed the material they use to make the paddles, and unfortunately they no longer erase well -- the material does not come completely clean. BUT, I have attached a piece of thin, high-quality white board material to the faces of the paddle. It writes and erases better than ever! So once again, you can get this wonderful close-up item again. But get it from us at TMGS, because if other dealers sell it as manufacturered, you will be buying nothing but disappointment. Creative close-up workers will have TONS of fun with this set of paddles and pens from Ian Adair (manufacturered by Sam Dalal). 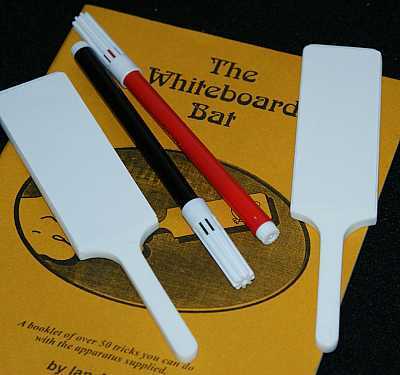 But even if you prefer to expend all your creativity on other pursuits, this paddle set comes with a booklet of 50 routines and ideas to give you plenty to work on (and use in your close up shows). Back in the 1950's, Ian Adair released a blank paddle that the performer could write on, draw symbols, dots, numbers, cards, etc. This blank paddle spawned a host of nifty routines from other close-up performers -- one of these, Jimmy Rogers' routine "I'll Start Again", can safely be regarded as a classic. (The Rogers routine is described in the booklet, so you can do it using this set of paddles). Well, 60+ years later, Ian has teamed up with Sam Dalal's FunTime Magic to re-release a version of his blank paddle. And it now uses dry erase markers, so it is even more versatile than in the old days. "I'll Start Again" (of course), where three lines drawn on the paddle magically vanish, appear, and jump from end to end and side to side. "Circle the Spot" -- after applying five different colored adhesive dots to the paddle on both sides, you circle a dot on one side without showing which one. Still, the spectator circles the same color dot on the other side. A mental match up. "Cupid's Heart", where a picture of an arrow magically shoots itself through a picture of a heart. Or "Any Color", in which you claim that your black marking pen can write any color. You demonstrate by making it write "red" -- that is, you simply write the word RED in black ink. As the spectators groan at this bad joke, you so a little magic and visibly change the word to red ink. You get the idea. Tons of magical possibilities -- you even get a second blank paddle so you can do transposition type routines, a la the classic Hopping Diamonds, but with drawn spots. Get this. You will use it a lot.